Happy Halloween, everyone. That’s from all of us here at the zoo…you know, me, Spook, and Scout (or, as she’s affectionately known, the Baby Goat). Spook has a Halloween costume. She hates it. And looking at this, you can probably understand why. 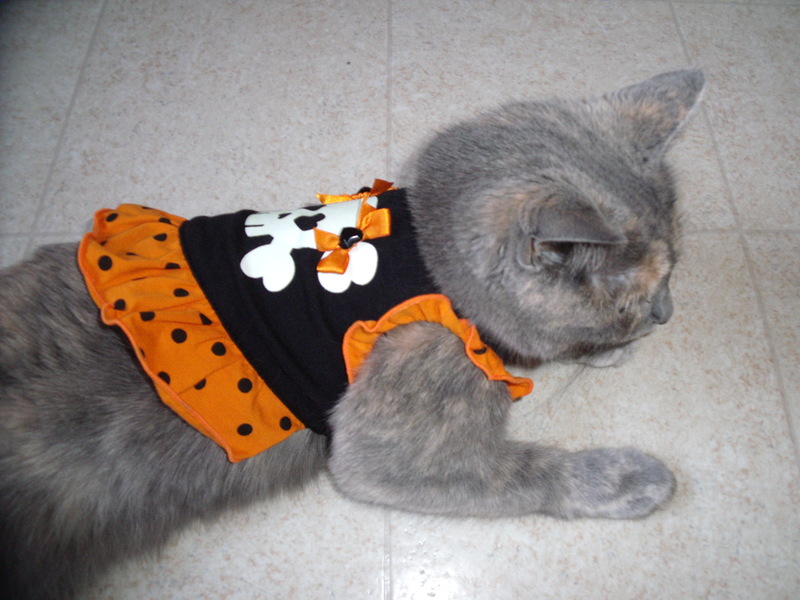 Poor kitty forced to wear something so undignified. 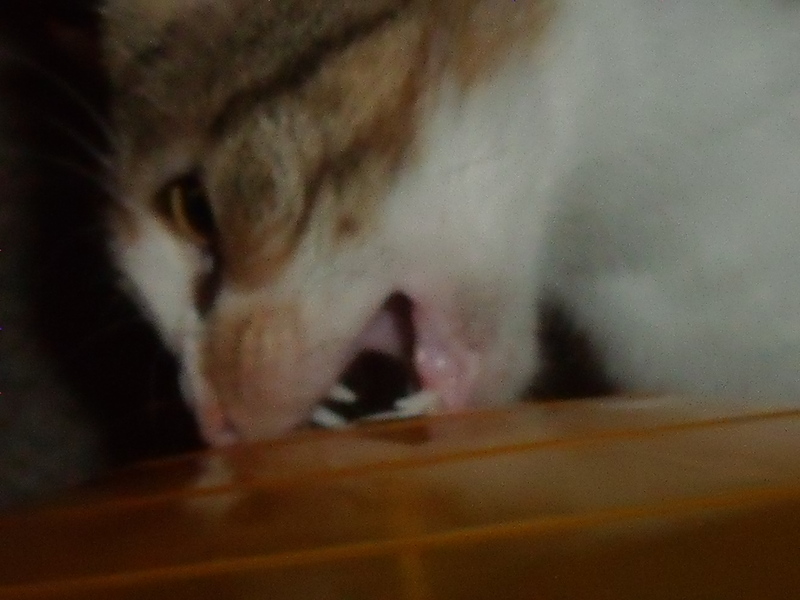 …like Dracula, she has fangs and isn’t afraid to use them. Happy Halloween from my little monsters…happy haunting, y’all! 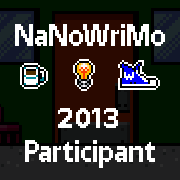 Are you sick of hearing about NaNoWriMo yet? Well, hold on. I’ve got something interesting here that might make you perk up your ears. I was perusing the NaNo site this evening (I know, I lead the most exciting life of anyone you know, right?) and came across the list of things winners (meaning you complete your 50,000 words in 30 days. Well, complete it and have it verified.) can walk away with. Of course, the number one thing all winners receive is immense satisfaction in setting and achieving a goal. And that’s nice…more than nice. There’s tremendous satisfaction in a job well done. But what caught my eye tonight was that all winners can have two copies of their completed book published by CreateSpace…free, just pay shipping. It used to be five copies, but I’d imagine that becomes a tad expensive for the company giving them away, so two copies it is this year. I still think that’s a pretty nifty reward. Being able to hold a copy of your published book in your hands would be quite the thrill, don’t you think? While reading the forums, I came across a question that does make me think I would want to do some research prior to going that route. Would having your book printed by CreateSpace have any bearing on having it picked up by a publishing house in the future (whew, sounds like I’ve got big plans for this book, doesn’t it?). Like I said, I would want to look into all of that before choosing to do it that way. Luckily, they give you until June, 2014 to redeem your offer. I would think that would be plenty of time for me to find the answers to any questions I have…oh yeah, and maybe do a little editing…that might come in handy too. So what do you think? Anybody have any advice for me about the publishing aspect? Anybody want me to shut up about NaNo? If you answered “yes” to that last question, my question to you would be, “Do you really know me? Do you believe it would be possible for me to remain quiet about something I’m so excited about?” Maybe you’ll just have to ignore me until the end of November. I won’t hold it against you, I promise. Or you could join in the fun and frenzy of NaNoWriMo! Come on! You know you want to. Okay, I am most definitely not a fashionista. I don’t follow the trends. Very rarely, do I even read about fashion. I would much rather be comfortable than be some kind of fashion icon (uh, yeah, like there’s a chance that’ll ever happen). So I was quite shocked to see all the buzz about Kate Middleton (you know, the chick that married her prince) wearing pantyhose. Apparently, pantyhose had become so last year that people were surprised to see a future princess wearing them. Really? So pantyhose went out of vogue while I had my back turned? How could I have missed this? I have to admit, I’m not much of a dress wearer…couldn’t actually tell you the last time I wore a dress. But if something came up and I was forced to wear a dress (and that would have to be a whole lot of force for that to happen), I can’t imagine that I wouldn’t wear pantyhose. Have you seen how white my legs are? (Ha, of course you haven’t.) That would not be a pretty sight with a dress. I never liked wearing pantyhose. They’re a struggle to get on, they’re not especially comfortable, you can ruin them in a split second, and you can spend a lot of money on them if you wear them frequently. However, pantyhose do make your legs look better (and if you’re one of those girls with naturally tan, toned legs…well, just keep your mouth shut, would you? ), and I always thought they kind of added the finishing touch to your dressy dresses. You might ask how someone who is a self-declared fashion idiot could dare to challenge all of the modern fashion mavens, and you’d be right to do so…what do I know? But now, there is a future princess taking on the fashion elite, bringing pantyhose back in style. Wait! Why should that make me happy? I hate pantyhose. I’ve had a smart phone for a while now. It’s handy, it’s convenient, it’s fun to be able to check in on what my friends are up to on facebook and twitter. I’ve even used it to publish posts on my blog. But I just couldn’t convince myself to cut the cord…the cord to my landline, that is. I’ve been mulling it over for quite some time. I’m paying a little over $40 a month for something that I’m using probably less than once a week. Is it worth it? As I’m attempting to simplify my life, I’ve found myself questioning how I’m spending my money. Could I put that $40+ to better use? I finally made the decision. I called AT&T today and cancelled my home service. Very few questions asked. The representative I spoke with offered a discount of $6 a month, but that didn’t do a lot for me. We continued the process and my landline will no longer be functional after midnight. End of story, right? Well…not quite. After I hung up, I kept trying to push my feelings aside, trying not to think about what was bothering me. Then I told myself to just feel whatever emotions are there swirling around and figure out why I’m feeling what I’m feeling. I’ve never been all that good at experiencing emotions (heck, that’s what I used food for… I didn’t want to have to feel anything. ), so I had to force myself to come back to it a few times. But I did it. I sat with it and was surprised at what I was feeling. I was feeling fear. Fear that I wouldn’t have a way to get help for myself if something happened to me and my cell phone wasn’t working. Fear that I would be isolated in an emergency. Considering I live in town in an apartment complex with over 200 apartments and townhouses, I’m not ever going to really be isolated. And my little friend Clara has forced me to get to know more of my neighbors. So the fear is a tad irrational. But…fear often is, isn’t it? After working through all of that, I realized there was more to it than plain fear. 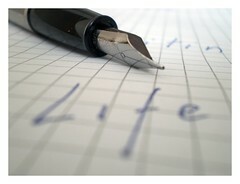 Have you ever noticed that nothing’s ever as simple as we think it should be? I’ve had a landline since before we called them landlines. Letting go of it brought up feelings of failure. Weird, huh? In my mind, I guess I still don’t fully think of cell phones as being “real” phones, and if I don’t have a “real” phone, well then, for some reason I see that as a failure on my part. Wow! There’s a lot there for me to work on. Once I worked that out, the feelings faded. After all, we all know that cell phones are so much more than the phones we grew up with (unless you’re a college kid as we speak). They’re these little bitty computers you can put in your pocket. Try doing that with Grandma’s old rotary wall phone!